Felicia Blow, APR, is an award-winning leader with extensive organizational, strategic planning, leadership and management experience. With a 28+-year career spanning work in manufacturing (Caterpillar, Inc.); waste management and environmental services (Southeastern Public Service Authority); telecommunications (Cox Communications); and higher education (Paul D. Camp and Tidewater Community Colleges), she currently serves as associate vice president for development and campaign director at Hampton University. In her role as campaign director, she has responsibility for the university’s $150 Million Dream No Small Dreams II Campaign. Blow is an active member of the Public Relations Society of America (PRSA), and the Hampton Roads, Virginia, Chapter. 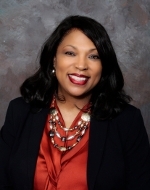 Within PRSA, she has served in numerous capacities including but not limited to: current member of the Board of Ethics and Professional Standards (BEPS); past president of the Hampton Roads, Virginia, PRSA Chapter; past chair of the PRSA Mid-Atlantic District Board; and past chair of the Universal Accreditation Board (UAB). In her time with the UAB, the Board’s vision of a specialized credential was achieved in the creation of the APR+M credential, which recognizes military public affairs professionals’ achievement of this important mark of distinction. Finally, she also served as a member of the National Board of PRSA from 2012 through 2014. Blow earned her bachelor’s degree in mass media arts from Hampton University; her Master of Business Administration from Strayer University; and she is currently pursuing her doctorate in higher education administration from Old Dominion University. She is Accredited by the Public Relations Society of America.